If you’ve ever sat on a dock and watched the sun slowly fade away, it’s easy to understand how docks serve a greater purpose than boat storage. 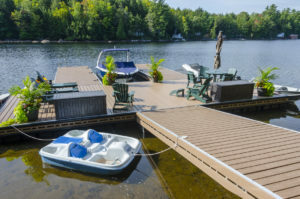 Docks are our connection to the water, and for most cottage owners they’re the go-to place for entertaining, relaxing, spending time with family and more. Whether you enjoy lounging with a new book, fishing, judging a cannonball competition or entertaining family and friends, a dock is where all the fun begins. While they function in providing safe harbour for our boats, they can also greatly enhance your cottage experience and value! Here are 5 ways to turn your dock into a waterfront oasis for the summer. 1) Add functionality with a premium dock ladder, steps or water gear storage. Aluminum ladders make it easier to get in and out of the water. 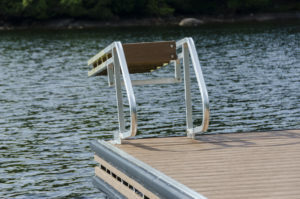 Available in black and aluminum finishes with cedar or PVC steps, choose a style that matches your dock and cottage. And when it comes to storing life jackets, ropes and safety equipment, storage bins can help keep your water gear safe and dry, while being easily accessible. 2) Extend your fun into the night with dock lighting. 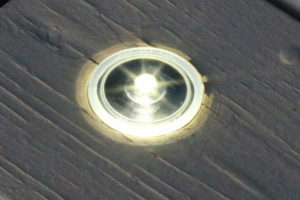 There are a number of stylish looking solar-powered dock lights available these days. Our favourites include Dot Lights that install flush with the dock, making them unnoticeable during the day and void of tripping hazards, or LED Dock Post Lights that last 18+ hours on a full charge. 3) Give your dock some colour with planter boxes. Colourful flowers and plants are a great way to add ambiance and compliment the waterfront views from your dock. Plants and flowers can help breathe new life into your waterfront! 4) Complete your waterfront with a flagpole. Give your dock its own unique style with a custom flag, which is both a conversation starter and landmark for boats passing by. 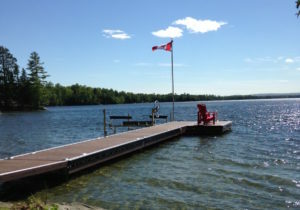 The classic Canadian Flag also adds a nice touch to any waterfront property! 5) Make it comfortable with chairs and furniture. If you spend more time on your dock than in your living room, it should have lounge furniture that’s just as comfortable. After all the water skis, tubes, and paddle boards are put away, there’s nothing better than kicking back and eating dinner on the dock. Do you day dream about your dock when you’re not there? If you answered yes, you’re doing something right! If not, contact R & J Machine for a new waterfront oasis. We’ve been supplying cottage owners with the highest quality dock systems for over 40 years!